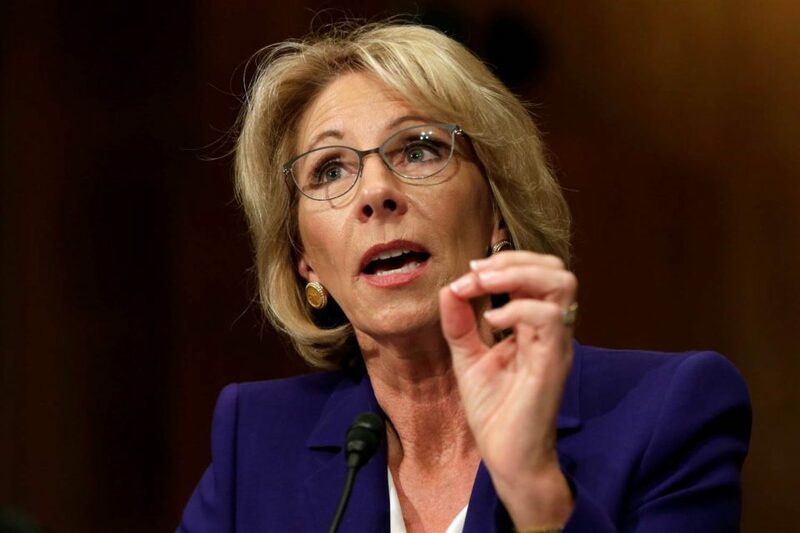 Laura Chapman discovered the list of staff hired to work at the U.S. Department of Education. All of the appointments to date are political cronies of Trump or DeVos. None of the high-level positions, which require an ethics review, have been filled. No educators have been appointed to any position. I have been trying to find out who is probably running the show at USDE. Here is a reasonably current list with the GS grade for the appointment. GS-07 means at minimum a bachelor’s degree. I have no idea what the post “Confidential Assistant” means, but it is certainly not a hallmark of transparency in governance. These seeme to be the “crony” positions. Patrick Shaheen-Confidential Assistant to the Secretary-GS-11 Field director for both the NH Republican State Committee and Americans for Prosperity. Alexandra Hudson-Special Assistant to the Secretary-GS-13 Lead Education Policy Analyst at Wisconsin Institute for Law & Liberty … Sales Associate at Kohl’s Department Stores, Tutor of political science, graduate of the London School of Economics. Writer for the Federalist. Deborah Cox-Roush-Special Assistant to the Secretary-GS-15 Trump Inaugural committee. Owner of DCR Creative Solutions of Florida, “an advocacy consulting and events Management Company.” Florida Grassroots Director for the Trump campaign (she previously worked for Rubio). Graduate of Georgetown College, BA in History/Education, 1976. Kevin Eck-Special Assistant to the Secretary-GS-15 Former director of operations for the Indiana Public Charter Schools Association. Holly Ham-Special Assistant to the Secretary-GS-15 Former sales executive at Hewlett Packard and Program Advisor to the Trump presidential campaign. Ronald Holden-Special Assistant to the Secretary-GS-15 Assistant Dean of Students/Director of Diversity and Inclusion at University of Mount Union. Amy Jones-Special Assistant to the Secretary-GS-15 Former CEO of Professional Development and Accountability at NYC Department of Education. Andrew Kossack-Special Assistant to the Secretary-GS-15 Former commissioner, Indiana Department of Revenue, was Policy Director for the Foundation for Excellence in Education, prior staff for Governor Mike Pence. Eric Ventimiglia-Special Assistant to the Secretary-GS-15 Legislative aid and constituents relations manager for the Michigan House of Representatives. Oakland University, BA in Political Science in 2007. Here are the official at USDE posted on website as of March 24, 2017. This list is quite different from the cronies list above. All of the following positions at USDE are listed as vacant. On April 3, 2014 about twenty states will be submitting to USDE their ESSA compliance plans. I think these will probably be unopened and just sit “somewhere” because nobody seems to be in charge of Elementary and Secondary Education. These plans run 150 pages or more and are supposed to be “approved” by someone at USDE after they are thoroughly reviewed. It is Amateur Hour and “Ask a Trump Crony” time in this and other administative offices. These are the components of the “administrative state” that Steve Bannon and Trump intend to “deconstruct.” That destruction appears to be the job of the cronies, not people competent to make reasoned judgments.